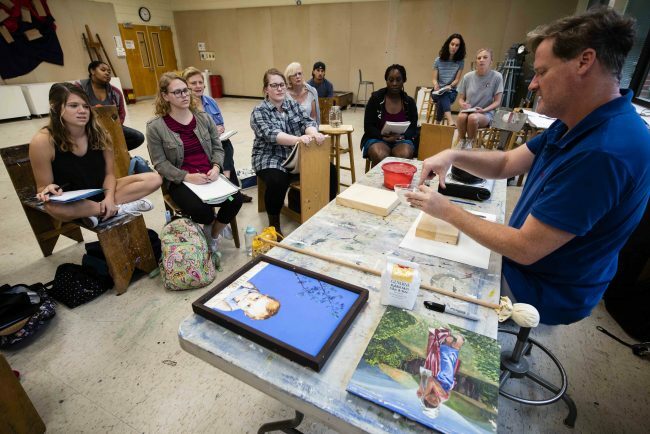 An art class at Georgia Southern University. The Georgia Southern University Betty Foy Sanders Department of Art (BFSDoArt) and the prestigious Chautauqua Institution’s School of Art in Chautauqua, New York, have partnered to provide educational opportunities and financial assistance to Georgia Southern’s visual arts students this summer. Georgia Southern and Chautauqua will provide up to two full scholarships for Georgia Southern students accepted into the renowned Visual Arts at Chautauqua Institution (VACI) School of Art summer residency program. The 2019 artists-in-residence program at VACI welcomes students and emerging artists who have yet to receive wide recognition of their work, including artists as young as juniors in college. The program has core faculty along with visiting artists who will hold workshops and give lectures through the summer. Core faculty will host weekly one-on-one conversations with students and emerging artists and will conduct classes of their specialties. The environment promotes collaboration, exchange and an openness to other art forms at Chautauqua, which includes dance, theater, music and more. The Chautauqua School of Art is an incubator of inclusive and expansive programming in the visual arts composed of classes, workshops and one-on-one time with mentors covering all media. The curriculum intentionally breaks apart the traditional methods that isolate disciplines from each other and instead embraces a full range of studio and pragmatic studies including professional development for artists, the art of pedagogy, writing in the 21st century and the relevance of art history today.